This entry was posted on Monday, September 14th, 2015 at 3:47 pm. I haven’t posted recently about my horse-kids, so here’s an update! You may recall my mentioning earlier this spring that Takoma had lost a lot of weight during the winter. It was just brutal for the old guys. But, finally, thankfully, she has started to pick up some pounds! She now gets three meals a day (which she loves), and I have found a weight gain supplement she actually likes – Cool Calories! Fingers crossed that this coming winter will be mild for my 34 year old girl. Misty is just as fat as Takoma was skinny! She wintered (and summered) very well, to say the least. While we haven’t been riding too much, Misty is doing great! She is content to snuggle with Takoma and torment Bailey over the fence-line. They have such a funny love/hate relationship. My “Squish” is such a sweetheart; I’m so happy I brought him home this summer. So happy, in fact, that I’m keeping him here. He and Traveller are not switching back for the winter; (Trav is at my mom’s new place and thriving with Patriot and Jack)! Bailey earned the nickname of Squish when the back of his paddock was flooded and he squished and splashed through it to get to his back field. That issue has been resolved, but “Squish” is here to stay! He is training nicely, and I’m hoping to get him to a dressage schooling show before the end of the year. That’s it! Nothing too exciting – but no news is good news, right? I’m hoping for a warm, dry fall so I can squeeze in as many rides before winter hits! Below is a picture of my side field from my office window. 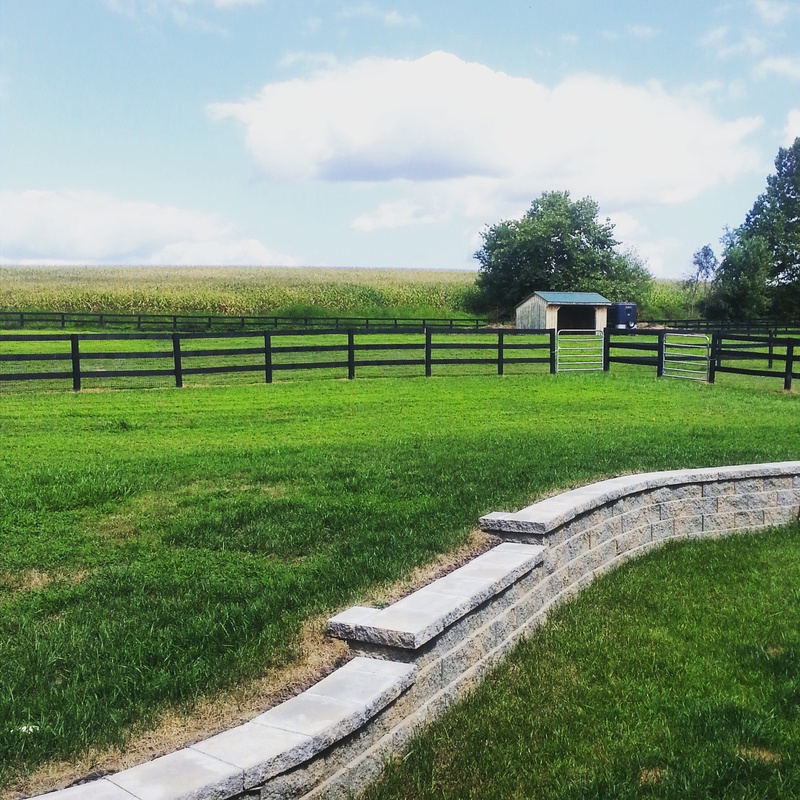 You can see some of the retaining wall that was part of our patio project. Will post more pictures of that soon!